"Regions of Spain" redirects here. For other uses, see Regions of Spain (disambiguation). 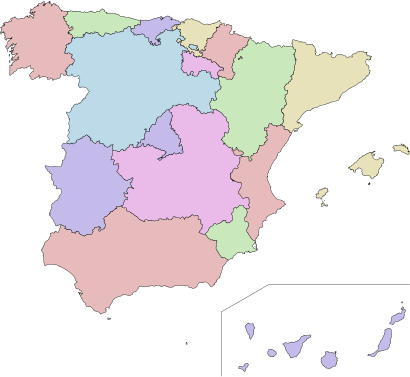 In Spain, an autonomous community (Spanish: comunidad autónoma) is a first-level political and administrative division, created in accordance with the Spanish constitution of 1978, with the aim of guaranteeing limited autonomy of the nationalities and regions that make up Spain. The autonomous communities are governed according to the constitution and their own organic laws known as Statutes of Autonomy,[iii] which contain all the competences that they assume. Since devolution was intended to be asymmetrical in nature, the scope of competences vary for each community, but all have the same parliamentary structure. From the 18th century onwards, the Bourbon kings and the government tried to establish a more centralized regime. Leading figures of the Spanish Enlightenment advocated for the building of a Spanish nation beyond the internal territorial boundaries. This culminated in 1833, when Spain was divided into 49 (now 50) provinces, which served mostly as transmission belts for policies developed in Madrid. However, unlike in other European countries such as France, where regional languages were spoken in rural areas or less developed regions, two important regional languages of Spain were spoken in some of the most industrialized areas, which, moreover, enjoyed higher levels of prosperity, in addition to having their own cultures and historical consciousness. These were the Basque Country and Catalonia. This gave rise to peripheral nationalisms along with Spanish nationalism. In a response to Catalan demands, limited autonomy was granted to Catalonia in 1914, only to be abolished in 1923. It was granted again in 1932 during the Second Spanish Republic, when the Generalitat, Catalonia's mediaeval institution of government, was restored. The constitution of 1931 envisaged a territorial division for all Spain in "autonomous regions", which was never fully attained—only Catalonia, the Basque Country and Galicia had approved "Statutes of Autonomy"—the process being thwarted by the Spanish Civil War that broke out in 1936, and the victory of the rebel Nationalist forces under Francisco Franco. During General Franco's dictatorial regime, centralism was most forcefully enforced as a way of preserving the "unity of the Spanish nation". Peripheral nationalism, along with communism and atheism were regarded by his regime as the main threats. His attempts to fight separatism with heavy-handed but sporadic repression, and his often severe suppression of language and regional identities backfired: the demands for democracy became intertwined with demands for the recognition of a pluralistic vision of the Spanish nationhood. The Fathers of the Constitution had to strike a balance between the opposing views of Spain—on the one hand, the centralist view inherited from Franco's regime, and on the other hand federalism and a pluralistic view of Spain as a "nation of nations"; between a uniform decentralization of entities with the same competencies and an asymmetrical structure that would distinguish the nationalities. Peripheral nationalist parties wanted a multinational state with a federal or confederal model, whereas the governing Union of the Democratic Centre (UCD) and the People's Alliance (AP) wanted minimum decentralization; the Spanish Socialist Workers' Party (PSOE) was sympathetic to a federal system. The constitution also explicitly established that the institutional framework for these communities would be a parliamentary system, with a Legislative Assembly elected by universal suffrage, a cabinet or "council of government", a president of such a council, elected by the Assembly, and a High Court of Justice. They were also granted a maximum level of devolved competencies. In terms of the scope of competences, the first additional disposition recognized the historical rights of the "chartered" territories,[iv] namely the Basque-speaking provinces, which were to be updated in accordance with the constitution. This recognition would allow them to establish a financial "chartered regime" whereby they would not only have independence to manage their own finances, like all other communities, but to have their own public financial ministries with the ability to levy and collect all taxes. In the rest of the communities, all taxes are levied and collected by or for the central government and then redistributed among all. The Statutes of Autonomy of the Basque Country and Catalonia were sanctioned by the Spanish Parliament on 18 December 1979. The position of the party in government, the Union of the Democratic Centre (UCD), was that only the three "historical nationalities" would assume full competences, while the rest would accede to autonomy via article 143, assuming fewer powers and perhaps not even establishing institutions of government. This was firmly opposed by the representatives of Andalusia, who demanded for their region the maximum level of competences granted to the "nationalities". After a massive rally in support of autonomy, a referendum was organized for Andalusia to attain autonomy through the strict requirements of article 151, or the "fast route"—with UCD calling for abstention, and the main party in opposition in Parliament, the Spanish Socialist Workers' Party (PSOE) calling for a vote in favour. These requirements were not met, as in one of the eight provinces, Almería, votes in favour—although the majority—did not amount to half of the electoral census as required. Yet, in general, the results of the referendum had been clear and unequivocal. After several months of discussion, the then prime minister of Spain, Adolfo Suárez and the leader of the opposition, Felipe González, reached an agreement to resolve the Andalusian issue, whereby the Parliament approved an amendment to the law that regulated referendums, and used a prerogative of article 144c of the constitution, both actions which combined would allow Andalusia to take the fast route. They also agreed that no other region would take the "fast route", but that all regions would establish a parliamentary system with all institutions of government. This opened a phase that was dubbed as café para todos, "coffee for all". This agreement was eventually put into writing in July 1981 in what has been called the "first autonomic pacts". Aragon, Castilla-La Mancha, Castile and León, Extremadura and the Valencian Community acceded to autonomy as communities integrated by two or more provinces with common historical, economic and cultural characteristics. The Balearic Islands and the Canary Islands acceded to autonomy as insular territories, the latter integrated by two provinces. Principality of Asturias, Cantabria, La Rioja and Murcia acceded to autonomy as single provinces with historical identity (also called "uniprovincial" autonomous communities). The province of Madrid, home to the national capital, was removed from Castilla-La Mancha (formerly New Castile), to which it previously belonged, and constituted as a single-province autonomous community in the "national interest", the Community of Madrid. On the other hand, Cantabria and La Rioja, although originally part of Old Castile—and both originally included in the "pre-autonomic regime" of Castile and León—were granted autonomy as single provinces with historical identity, a move supported by the majority of their populations. The "autonomic pacts" give both Cantabria and La Rioja the option of being incorporated into Castile and León in the future, and required that the Statutes of Autonomy of all three communities include such a provision. León, a historical kingdom and historical region of Spain, once joined to Old Castile to form Castile and León, was denied secession to be constituted as an autonomous community on its own right. During the second half of the 1980s, the central government seemed reluctant to transfer all competences to the "slow route" communities. After the five years set up by the constitution, all "slow route" communities demanded the maximum transfer guaranteed by the constitution. This led to what has been called the "second autonomic pacts" of 1992, between the then prime minister of Spain Felipe González from PSOE and the leader of the opposition, José María Aznar from the newly created People's Party (PP) successor of the People's Alliance party. Through these agreements new competences were transferred, with the reforms to many Statutes of Autonomy of the "slow-route" communities with the aim of equalizing them to the "fast route" communities. In 1995, the cities of Ceuta and Melilla were constituted as "autonomous cities" without legislative powers, but with an autonomous assembly[clarification needed] not subordinated to any other province or community. With the implementation of the Autonomous Communities, Spain went from being one of the most centralized countries in the OECD to being one of the most decentralized; in particular, it has been the country where the incomes and outcomes of the decentralized bodies (the Autonomous Communities) has grown the most, leading this rank in Europe by 2015 and being fifth among OECD countries in tax devolution (after Canada, Switzerland, the United States and Austria). By means of the State of Autonomies implemented after the Spanish Constitution of 1978, Spain has been quoted to be "remarkable for the extent of the powers peacefully devolved over the past 30 years" and "an extraordinarily decentralized country", with the central government accounting for just 18% of public spending, 38% for the regional governments, 13% for the local councils, and the remaining 31% for the social security system. In terms of personnel, by 2010 almost 1,350,000 people or 50.3% of the total civil servants in Spain were employed by the autonomous communities; city and provincial councils accounted for 23.6% and those employees working for the central administration (police and military included) represented 22.2% of the total. In 2004 the Basque Parliament approved the Ibarretxe Plan, whereby the Basque Country would approve a new Statute of Autonomy containing key provisions such as shared sovereignty with Spain, full independence of the judiciary, and the right to self-determination, and assuming all competences except that of the Spanish nationality law, defense, and monetary policy. The plan was rejected by the Spanish Parliament in 2005 and the situation has remained largely stable in that front so far. A particularly contentious point -especially in Catalonia- has been the one of fiscal tensions, with Catalan nationalists intensifying their demand for further financing over the last few years. In this regard, the new rules for fiscal decentralisation in force since 2011 already make Spain one of the most decentralised countries in the world also in budgetary and fiscal matters, with the base for income tax split at 50/50 between the Spanish government and the regions (something unheard of in much bigger federal states such as Germany or the United States, which retain the income tax as an exclusively federal one). Besides, each region can also decide to set its own income tax bands and its own additional rates, higher or lower than the federal rates, with the corresponding income accruing to the region which no longer has to share it with other regions. This current level of fiscal decentralisation has been regarded by economists such as Thomas Piketty as troublesome since, in his view, "challenges the very idea of solidarity within the country and comes down to playing the regions against each other, which is particularly problematic when the issue is one of income tax as this is supposed to enable the reduction of inequalities between the richest and the poorest, over and above regional or professional identities". The severe economic crisis in Spain that started in 2008 produced different reactions in the different communities. On one hand, some began to consider a return of some responsibilities to the central government. while, on the other hand, in Catalonia debate on the fiscal deficit—Catalonia being one of the largest net contributors in taxes[citation needed]— led many who are not necessarily separatist but who are enraged by the financial deficit to support secession. In September 2012, Artur Mas, then Catalonia's president, requested from the central government a new "fiscal agreement", with the possibility of giving his community powers equal to those of the communities of chartered regime, but prime minister Mariano Rajoy refused. Mas dissolved the Catalan Parliament, called for new elections, and promised to celebrate a referendum on independence within the next four years. Rajoy's government declared that they would use all "legal instruments"—current legislation requires the central executive government or the Congress of Deputies to call for or sanction a binding referendum— to block any such attempt. The Spanish Socialist Workers' Party and its counterpart in Catalonia proposed to reopen the debate on the territorial organization of Spain, changing the constitution to create a true federal system to "better reflect the singularities" of Catalonia, as well as to modify the current taxation system. The Statute of Autonomy is the basic institutional law of the autonomous community or city, recognized by the Spanish constitution in article 147. It is approved by a parliamentary assembly representing the community, and then approved by the Cortes Generales, the Spanish Parliament, through an "Organic Law", requiring the favourable vote of the absolute majority of the Congress of Deputies. The constitution establishes that all competences not explicitly assumed by the state—the central government—in the constitution, can be assumed by the autonomous community in their Statutes of Autonomy; but also, all competences not explicitly assumed by the autonomous community in their Statutes of Autonomy are automatically assumed by the state. In case of conflict, the constitution prevails. In case of disagreement, any administration can bring the case before the Constitutional Court of Spain. The majority of the communities have approved regional electoral laws within the limits set up by the laws for the entire country. Despite minor differences, all communities use proportional representation following D'Hondt method; all members of regional parliaments are elected for four-year terms, but the president of the community has the faculty to dissolve the legislature and call for early elections. Nonetheless in all communities, with the exception of the Basque Country, Catalonia, Galicia, and Andalusia, elections are celebrated the last Sunday of May every four years, concurrent with municipal elections in all Spain. Given the ambiguity in the constitution that did not specify which territories were nationalities and which were regions, other territories, besides the implicit three "historical nationalities", have also chosen to identify themselves as nationalities, in accordance with their historical regional identity, such as Andalusia, Aragon, the Balearic Islands, the Canary Islands, and the Valencian Community. The autonomic agreements of 1982 and 1992 tried to equalize powers (competences) devolved to the 17 autonomous communities, within the limits of the constitution and the differences guaranteed by it. This has led to an "asymmetrical homogeneity". In the words of the Constitutional Court of Spain in its ruling of August 5, 1983, the autonomous communities are characterized by their "homogeneity and diversity...equal in their subordination to the constitutional order, in the principles of their representation in the Senate, in their legitimation before the Constitutional Court, and in that the differences between the distinct Statutes [of Autonomy] cannot imply economic or social privileges; however, they can be unequal with respect to the process to accede to autonomy and the concrete determination of the autonomic content of their Statute, and therefore, in their scope of competences. The autonomic regime is characterized by an equilibrium between homogeneity and diversity ... Without the former there will be no unity or integration in the state's ensemble; without the latter, there would not be [a] true plurality and the capacity of self-government". How the communities are financed has been one of the most contentious aspects in their relationship with the central government. The constitution gave all communities significant control over spending, but the central government retained effective control of their revenue supply. That is, the central government is still charge of levying and collecting most taxes, which it then redistributes to the autonomous communities with the aim of producing "fiscal equalization". This applies to all communities, with the exception of the Basque Country and Navarre. Central government funding is the main source of revenue for the communities of "common regime". Redistribution, or transfer payments, are given to the communities of common regime to manage the responsibilities they have assumed. The amount they receive is based upon several calculations which include a consideration for population, land area, administrative units, dispersal of population, relative poverty, fiscal pressure and insularity. The central government is committed to returning a specific percentage of taxes to all communities with common regime, within the differences allowed for fiscal equalization. The communities of common regime have the ability to add a surcharge to the so-called "ceded taxes"—taxes set at the central level, but collected locally—and they can lower or raise personal income taxes up to a limit. The Basque Country and Navarre were granted an exception in the fiscal and financial system through the first additional disposition of the constitution that recognizes their historical "charters"[viii] —hence they are known as "communities of chartered regime" or "foral regime". Through their "chartered regime", these communities are allowed to levy and collect all so-called "contracted taxes", including income tax and corporate tax, and they have much more flexibility to lower or raise them. This "chartered" or "foral" contract entails true financial autonomy. Since they collect almost all taxes, they send to the central government a pre-arranged amount known as cupo, "quota" or aportación, "contribution", and the treaty whereby this system is recognized is known as concierto, "treaty", or convenio, "pact". Hence they are also said to have concierto económico, an "economic treaty". Since they collect all taxes themselves and only send a prearranged amount to the central government for the competences exclusive to the state, they do not participate in "fiscal equalization", in that they do not receive any money back. In the Basque Country, the provinces, renamed as "historical territories",[iv] are governed by "chartered deputations"[xvi]—with assume the competences of a provincial deputation as well as the fiscal powers of their "chartered regime"—and by "General Juntas" [xvii]—parliaments with legislative powers. ^ a b c d "Organización territorial. El Estado de las Autonomías" (PDF). Recursos Educativos. Instituto Nacional de Tecnologías Educativas y de Formación del Profesorado. Ministerio de Eduación, Cultura y Deporte. Retrieved 19 October 2012. ^ Article 2. Cortes Generales (Spanish Parliament) (1978). "Título Preliminar". Spanish Constitution of 1978. Retrieved 29 September 2012. ^ Article 143. Cortes Generales (Spanish Parliament) (1978). "Título VIII. De la Organización Territorial del Estado". Spanish Constitution of 1978. Retrieved 29 September 2012. ^ Bacigalupo Sagesse, Mariano (June 2005). "Sinópsis artículo 145". Constitución española (con sinópsis). Congress of the Deputies. Retrieved 28 January 2012. ^ a b c d e f Ruíz-Huerta Carbonell, Jesús; Herrero Alcalde, Ana (2008). Bosch, Núria; Durán, José María, eds. Fiscal Equalization in Spain. Fiscal Federalism and Political Decentralization: Lessons from Spain, Germany and Canada. Edward Elgar Publisher Limited. ISBN 9781847204677. Retrieved 15 October 2012. ^ a b c d Börzel, Tanja A (2002). States and Regions in the European Union. University Press, Cambridge. pp. 93–151. ISBN 978-0521008600. Retrieved 20 October 2012. ^ a b Villar, Fernando P. (June 1998). "Nationalism in Spain: Is It a Danger to National Integrity?". Storming Media, Pentagon Reports. Retrieved 3 February 2012. ^ a b c Moreno Hernández, Luis Manuel. "Federalization in Multinational Spain" (PDF). Unidad de Políticas Comparadas. Retrieved 8 October 2012. ^ Jackson, Gabriel (1965). The Spanish Republic and the Civil War. United States of America: Princeton University Press. p. 15. ISBN 978-0-691-00757-1. ^ a b c d e f Schrijver, Frans (30 June 2006). Regionalism after Regionalisation. Spain, France and the United Kingdom. Vossiupers UvA. Amsterdam University Press. ISBN 978-9056294281. Retrieved 14 October 2012. ^ Moreno Fernández, Luis Miguel (2008) [April 1997]. La federalización de España. Poder político y territorio (2nd ed.). Siglo XXI España Editores. p. 112. ISBN 978-8432312939. ^ a b c d e f Conversi, Daniele (2002). "The Smooth Transition: Spain's 1978 Constitution and the Nationalities Question" (PDF). National Identities, Vol 4, No. 3. Carfax Publishing, Inc. Archived from the original (PDF) on 11 May 2008. Retrieved 28 January 2008. ^ Moreno Fernández, Luis Miguel (2008) [April 1997]. La federalización de España. Poder político y territorio (2nd ed.). Siglo XXI España Editores. pp. 98, 99. ISBN 978-8432312939. ^ Moreno Fernández, Luis Miguel (2008) [April 1997]. La federalización de España. Poder político y territorio (2nd ed.). Siglo XXI España Editores. pp. 78, 79. ISBN 978-8432312939. ^ a b c Aparicio, Sonia. "Café para Todos". La España de las Autonomías. Un Especial de elmundo.es. Retrieved 29 January 2012. ^ a b Portero Molina, José Antonio (2005). Vidal Beltrán, José María; García Herrera, Miguel Ángel, eds. El Estado de las Autonomías en Tiempo de Reformas. El Estado Autonómico: Integración, Solidaridad, Diversidad, Volumen 1. Instituto Nacional de Administración Pública. pp. 39–64. ISBN 978-8478799770. Retrieved 29 September 2012. ^ Delgado-Ibarren García-Campero, Manuel (June 2005). "Sinópsis artículo 2". Constitución española (con sinópsis). Congress of the Deputies. Retrieved 28 January 2012. ^ "Devolution of Powers in Spain" (PDF). Archived from the original (PDF) on 2016-10-12. Retrieved 2016-03-31. ^ a b c d e f g h i j k l Pérez Royo, Javier (December 1999). Hernández Lafuente, Adolfo, ed. Desarrollo y Evolución del Estado Autonómico: El Proceso Constituyente y el Consenso Constitucional. El Funcionamiento del Estado Autonómico. Ministerio de Administraciones Públicas. pp. 50–67. ISBN 978-8470886904. Retrieved 7 October 2012. ^ a b c d Núñez Seixas, Xosé M (2000). Álvarez Junco, José; Schubert, Adrian, eds. The awakening of peripheral nationalisms and the State of the Autonomous Communities. Spanish History since 1808. Arnold Publishers. pp. 315–330. ISBN 978-0340662298. Retrieved 9 October 2008. ^ a b c d e f g Clavero Arévalo, Manuel (2006). "Un balance del Estado de las Autonomías" (PDF). Colección Mediterráneo Económico, num. 10. Fundación Caja Rural Intermediterránea. Archived from the original (PDF) on April 9, 2010. Retrieved 7 October 2012. ^ Barbería, José Luis (30 September 2012). "¿Reformamos la Constitución?". El País. Retrieved 23 September 2012. ^ Alonso de Antonio, José Antonio (June 2003). "Sinópsis artículo 143". Constitución española (con sinópsis). Congress of the Deputies. Retrieved 29 January 2012. ^ a b c d Congreso de los Diputados (1978). "Título VIII. De la Organización Territorial del Estado. Capítulo tercero. De las Comunidades Autónomas. Artículos 143 a 158". Constitución española. Retrieved 22 October 2012. ^ a b Alonso de Antonio, José Antonio (December 2003). "Sinópsis Disposición Transitoria 2". Congress of Deputies. Retrieved 29 September 2012. ^ Congreso de los Diputados (1978). "Disposiciones transitorias". Constitución española. Retrieved 22 October 2012. ^ Rebollo, Luis Martín (2005). Ministerio de Justicia, ed. Consideraciones sobre la Reforma de los Estatutos de Autonomía de las Comunidades Autónomas. La Reforma Constitucional: XXVI Jornadas de Estudio (27, 28 y 29 de octubre de 2004). Dirección del Servicio Jurídico del Estado. ISBN 978-84-7787-815-5. Retrieved 3 November 2012. ^ a b "Acuerdos Autonómicos firmados por el Gobierno de la Nación y el Partido Socialista Obrero Español el 31 de julio de 1981" (PDF). 31 July 1981. Retrieved 11 October 2012. ^ García Ruíz, José Luis (2006). García Ruíz, José Luis; Girón Reguera, Emilia, eds. Dos siglos de cuestión territorial: de la España liberal al Estado de las autonomías. Estudios sobre descentralización territorial. El caso particular de Colombia. Servicio de Publicaciones. Universidad de Cádiz. pp. 109–126. ISBN 978-8498280371. Retrieved 21 October 2012. ^ Moreno Fernández, Luis Miguel (2008) [April 1997]. La federalización de España. Poder político y territorio (2nd ed.). Siglo XXI España Editores. p. 66. ISBN 978-8432312939. ^ Ramon Marimon (23 March 2017). "Cataluña: Por una descentralización creíble". El País. Retrieved 24 March 2017. ^ Fiscal Federalism 2016: Making Decentralization Work. OCDE. ^ País, Ediciones El (2011-07-30). "Que al funcionario le cunda más | Edición impresa | EL PAÍS". El País. Elpais.com. Retrieved 2012-04-30. ^ Keatings, Michael (2007). "Federalism and the Balance of power in European States" (PDF). Support for Improvement in Governance and Management. Organisation for Economic Co-operation and Development, Inc. Retrieved 28 January 2012. ^ a b c d e f g h i j k l Smith, Andy; Heywood, Paul (August 2000). "Regional Government in France and Spain" (PDF). University College London. Retrieved 20 October 2012. ^ a b Junco, José Álvarez (3 October 2012). "El sueño ilustrado y el Estado-nación". El País. Retrieved 23 October 2012. ^ a b c d Piketty, Thomas (2017-11-14). "The Catalan Syndrom". lemonde.fr. Retrieved 2017-11-14. ^ "Varias autonomías meditan devolver competencias por el bloqueo del gobierno". ABC. 29 July 2011. Retrieved 29 January 2012. ^ "Catalonia: Europe's next state. A row about money and sovereignty". The Economist. 22 September 2012. Retrieved 29 September 2012. ^ Tremlett, Giles; Roberts, Martin (28 September 2012). "Spain's cultural fabric tearing apart as austerity takes its toll". The Guardian. Retrieved 29 September 2012. ^ "Two thirds of the Catalan Parliament approve organising a self-determination citizen vote within the next 4 years". Catalan News Agency. 28 September 2012. Archived from the original on 1 October 2012. Retrieved 29 September 2012. ^ "Ley Orgánica 2/1980, de 18 de enero, sobre Regulación de las Distintas Modalidades de Referéndum". Congress of the Deputies, Spain. 18 January 1980. Retrieved 29 September 2012. ^ "Spain heads towards confrontation with Catalan parliament". The Guardian. 27 September 2012. Retrieved 29 September 2012. ^ Calvo, Vera Gutiérrez; País, El (24 September 2012). "Rubalcaba, a favor de cambiar la Constitución para ir a un Estado federal". El País. Retrieved 29 September 2012. ^ "Navarro presenta la seva candidatura aquesta tarda a Terrassa". El Periódico de Catalunya. 28 September 2012. Retrieved 29 September 2012. ^ a b c d de Carreras Serra, Francesc (2005). El Estado de las Autonomías en España. Descentralización en Perspectiva Comparada: España, Colombia y Brasil. Plural Editores. ISBN 978-9990563573. Retrieved 12 October 2012. ^ Castelao, Julio (June 2005). "Sinópsis artículo 137". Constitución española (con sinópsis). Congress of the Deputies. Retrieved 14 October 2012. ^ "Madrid aporta al Estado más del doble que Cataluña". Cinco Días. 29 November 2007. Retrieved 1 April 2012. ^ Ministerio de Hacienda y Administraciones Públicas (Ministry of the Treasury and Public Administrations). "Régimen foral". Retrieved 1 April 2012. ^ "Deuda de las Comunidades Autónomas 2017". ^ Preamble to the Constitution. Cortes Generales (27 December 1978). "Spanish Constitution". Tribunal Constitucional de España. Archived from the original on 17 January 2012. Retrieved 28 January 2012. ^ Third article. Cortes Generales (27 December 1978). "Spanish Constitution". Tribunal Constitucional de España. Archived from the original on 17 January 2012. Retrieved 28 January 2012. ^ "Spain". The CIA World Factbook. Central Intelligence Agency. Retrieved 22 October 2012. ^ Lewis, M. Paul, ed. (2009). "Aragonese". Ethnologue: Languages of the World, Sixteenth Edition. Dallas, TX: SIL International. Retrieved 25 November 2012. ^ Lewis, M. Paul, ed. (2009). "Asturian". Ethnologue: Languages of the World, Sixteenth Edition. Dallas, TX: SIL International. Retrieved 25 November 2012. ^ Lewis, M. Paul, ed. (2009). "Basque". Ethnologue: Languages of the World, Sixteenth Edition. Dallas, TX: SIL International. Retrieved 25 November 2012. ^ Lewis, M. Paul, ed. (2009). "Catalan". Ethnologue: Languages of the World, Sixteenth Edition. Dallas, TX: SIL International. Retrieved 25 November 2012. ^ Lewis, M. Paul, ed. (2009). "Galician". Ethnologue: Languages of the World, Sixteenth Edition. Dallas, TX: SIL International. Retrieved 25 November 2012. ^ "BOE.es - Documento BOE-A-2001-7994". ^ "Estatutos de Autonomía comparados por materias". Secretaría de Estado de Administraciones Públicas (in Spanish). Ministerio de Hacienda y Administraciones Públicas. Gobierno de España. Archived from the original on 6 October 2014. ^ "EL MODELO DE FINANCIACIÓN DE LAS COMUNIDADES AUTÓNOMAS DE RÉGIMEN COMÚN. Liquidación definitiva 2009". Ministerio de Política Territorial y Administración Pública (in Spanish). November 2011. p. 13. Archived from the original (PDF) on 18 March 2015. Retrieved 2 December 2018. 1 Has part of its territory outside Europe. 2 Considered European for cultural, political and historical reasons but is geographically in Western Asia.